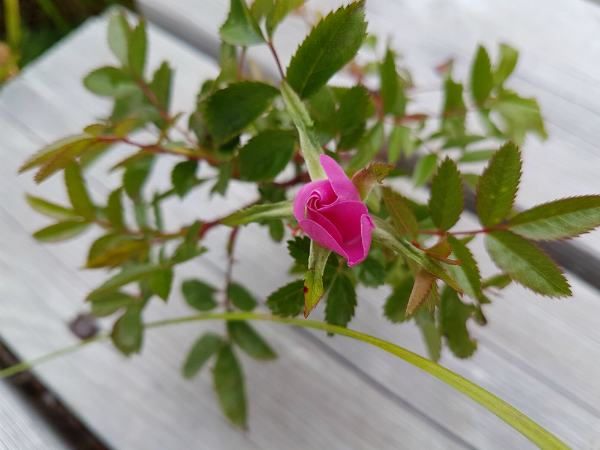 I love knowing the names of the flowers and birds we see on our hikes, so I have books about both and we often refer to the books after seeing something new. I would love to know more about identifying all of the different rocks we see, too, but I'm still looking for a good book to help me there. If you know one, be sure to let me know in the comments! Nathan likes to know names too, so he often asks me what something is while we're out hiking. A couple of weeks ago he asked me about a low growing plant with red berries that we see everywhere and I told him it's called cracker berry. Of course, the next question was, "Can you eat the berries?" I told him you can, but they really don't have much flavour, so we don't bother. Nathan has recently made friends with a guy living up the road who is here from Jamaica and there are blueberry bushes near his apartment. While Nathan was taking Dane to where they could pick the blueberries, they passed some cracker berry plants and Dane asked if Nathan knew what they were, and if you could eat them, so Nathan repeated what I had told him. When he told me the story (on yet another hike where the woods were full of cracker berries), Nathan said, "I'm just using the information you gave me!" We do that a lot, don't we? We get information from so many different sources every day - friends, family, news programs, social media, books, websites...Some of that information is good, some not so good. Sometimes we're specifically looking for information, like when we watch the news or ask questions or when kids are in school. Other times, though, we're not even aware that we're taking in and filing away information. 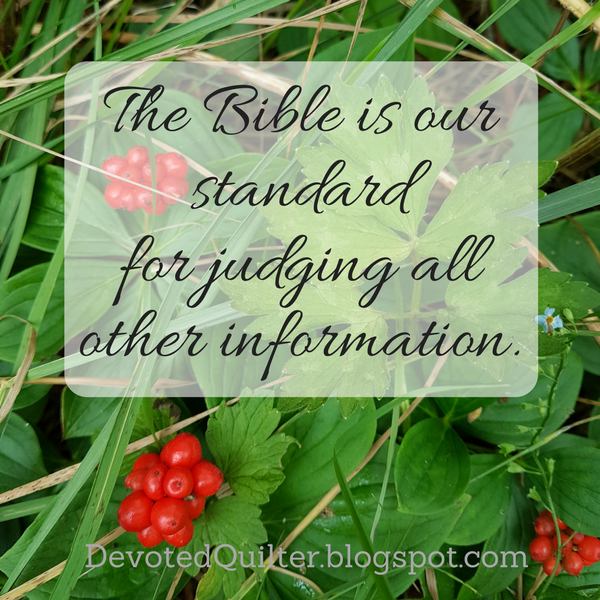 Some of that information we've filed away without realizing it could affect our view of God and what we think is His view of us. Someone who has an abusive or neglectful father will store that information under the category "what fathers are like," so when they are told that God is our Father, they are drawing on faulty information to create their image of God as Father. Someone who is constantly treated with disrespect and contempt will store that information under "my worth" and will struggle to believe that God could love them, while someone who is told they're stupid will file that under "my worth" as well and will believe they have nothing to offer. With all this information coming at us constantly, we need to be paying attention. We need to be asking ourselves, "Is this good information?" This is true for all of the information we take in, but it is especially true of those things that affect how we view God and those things that affect how we think He views us. "Dear friends, let us love one another, for love comes from God. Everyone who loves has been born of God and knows God. Whoever does not love does not know God, because God is love" (1John 4:7, 8). "But you, Lord, are a compassionate and gracious God, slow to anger, abounding in love and faithfulness" (Psalm 86:15). 2. God made each one of us for a purpose and we are all precious to Him. "So God created mankind in his own image, in the image of God he created them; male and female he created them" (Genesis 1:27). "For you created my inmost being; you knit me together in my mother’s womb. I praise you because I am fearfully and wonderfully made; your works are wonderful, I know that full well" (Psalm 139:13, 14). "See what great love the Father has lavished on us, that we should be called children of God! And that is what we are!" (1 John 3:1). "Now you are the body of Christ, and each one of you is a part of it" (1 Corinthians 12:27). These are things we can trust as good information. Any information we take in that is contrary to what we read in the Bible is bad information and we should discard it immediately rather than filing it away. Often, that is easier said than done, but if we are aware that it is bad information at least, we can try to discard it each time it comes to mind. We bought Aiden his first drum set for Christmas 2011 after he had spent months taking all of my metal mixing bowls and my pots, then spreading everything out around him and drumming on them with my wooden spoons. In May 2013, he upgraded to a larger set (he looks like such a baby in those pictures! Wow!) Talking to Aiden about music is like talking to me about quilting...there's the same enthusiasm in his voice, the same excitement about all the things he's doing or wants to do. This weekend, he'll be performing in a music festival. A local musician was so impressed by Aiden and his friends, when he heard them a few months ago, that he asked them to be his band for this festival. It will be Aiden's first performance outside of a school setting and we're all looking forward to it (Aiden, especially!). Because he's performing, Aiden gets into the festival for free. He also gets one ticket for a guest. Let's say I'm the one using that guest ticket. Because I'm going with Aiden, I get in for free, even though I'm not doing anything to contribute to the festival. Really, that's for their benefit, because I have zero musical talent, so they don't want me trying to contribute! All I have to do to get in is show up and say I'm with Aiden and they'll let me in, even though I didn't pay for a ticket and I'm not doing any of the work. Sound familiar? Jesus has offered all of us a 'guest ticket' to relationship and eternal life with God. Jesus did all the work and now we are able to have that eternal life simply because we're with Him. "For God so loved the world that he gave his one and only Son, that whoever believes in him shall not perish but have eternal life" (John 3:16). There are a lot of people still trying to earn their way into heaven, but it doesn't work that way. It's not like the festival tickets, where some people are getting in free because they're performing, others are getting in free because they're guests and everyone else can just buy a ticket. The only way to God is through Jesus. My work can't get me saved. Neither can yours. No matter how hard we try, it will never be enough, because we have no talent for righteousness, any more than I have for music. Fortunately, God isn't looking for people who have righteousness figured out, because He knows we can't do it. 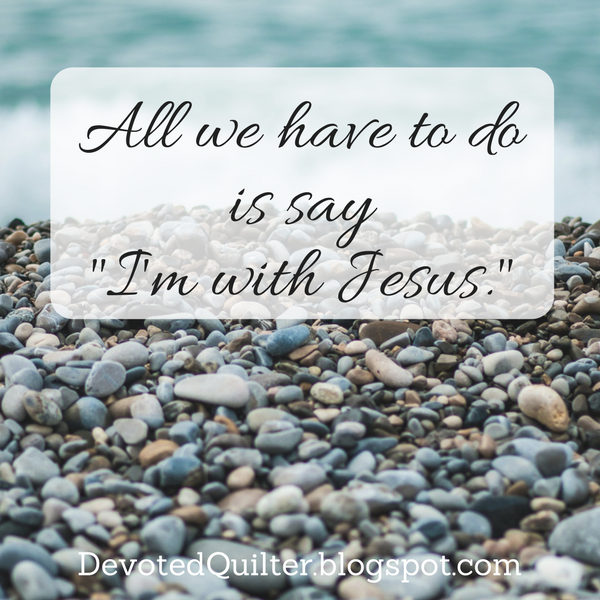 Instead, He is looking for those who are willing to admit they can't do it on their own and who are willing to say, "I'm with Jesus." 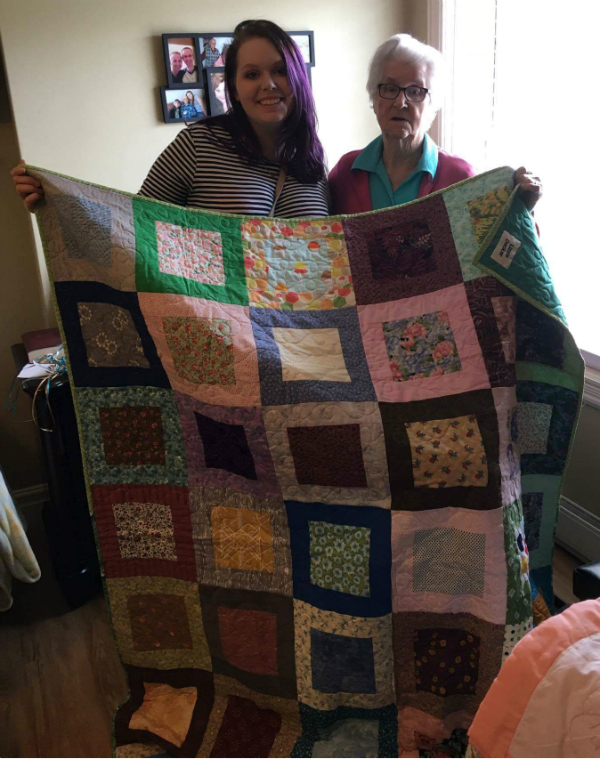 I know you've been waiting to see pictures of the residents with their quilts, so here you go! 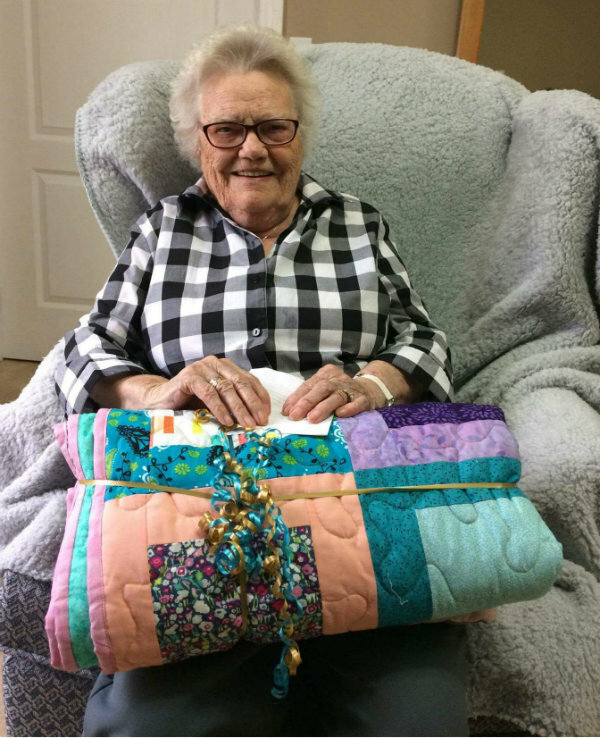 I don't have pictures of all of the residents with their quilts, but I do have 7. 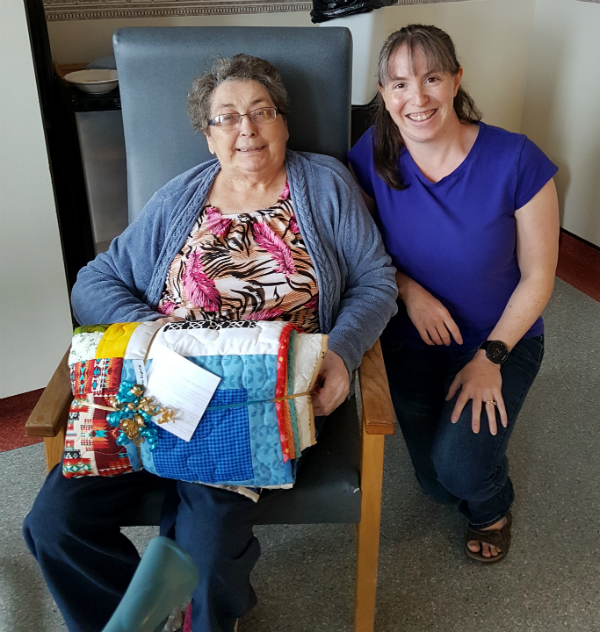 Delivering the quilts has taken a while because the residents are rather spread out. Some in a home 2 hours away in this direction, some more in a home 2 hours away in the other direction...that sort of thing. Thankfully I've had a few people help with the deliveries. 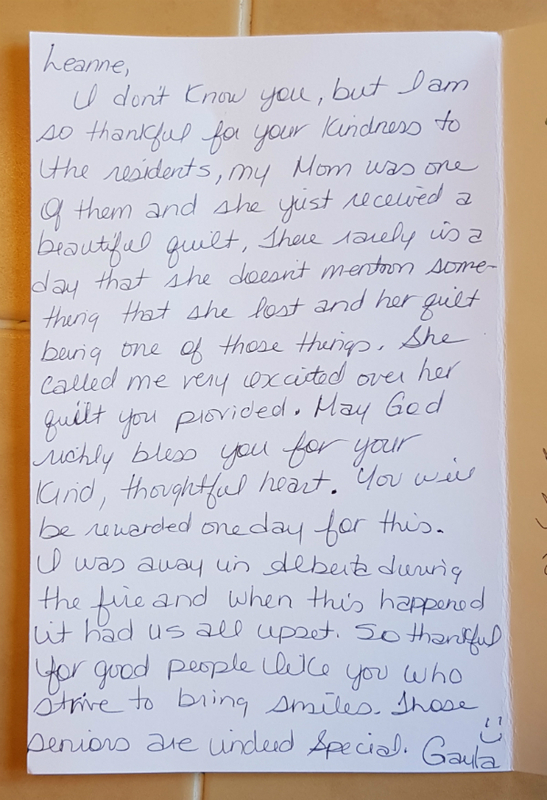 I also had the most wonderful note show up in my mailbox one day this week. It seriously made my day! 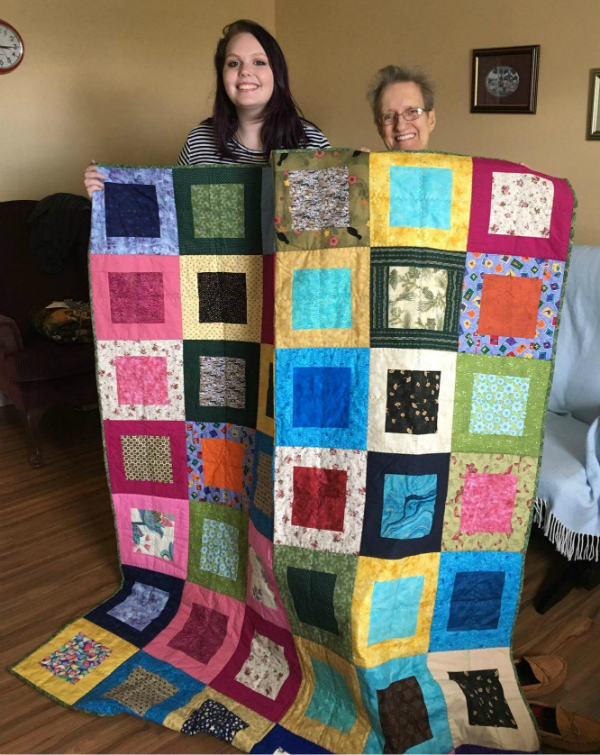 Isn't it nice to know the quilts are being appreciated? 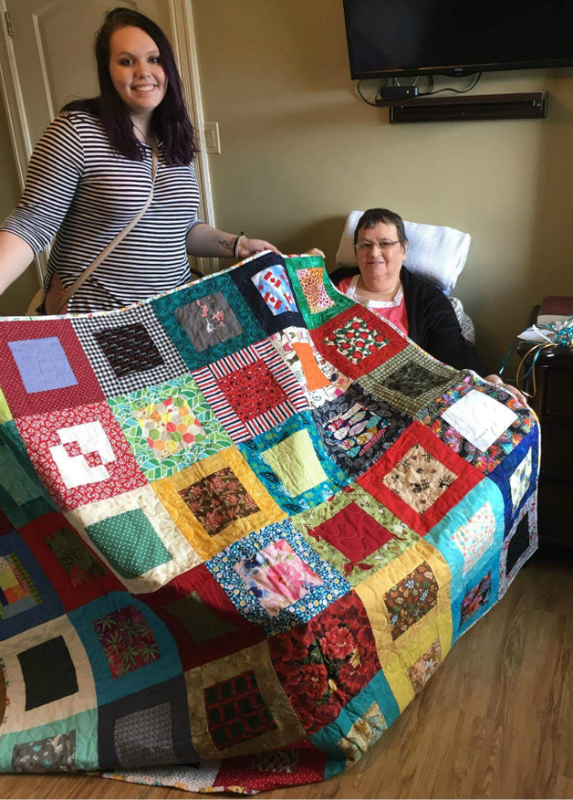 This note definitely goes to every one of you who sent blocks or batting or whatever to help with these quilts, as well as everyone who helped put the quilts together. I love camping in our tent. There's something about sleeping in a tent that feels wonderful and, believe it or not, luxurious to me. It's like sleeping directly outside, but with something to keep the bugs away, lol. Waking in the morning is my favourite part, when the tent is all warm and full of sunshine and the birds are chirping all around us. That being said, I am also glad I live in a time when sleeping in a tent is a recreational thing and not an everyday thing. Especially since we live in Newfoundland, where the winters are cold and snowy. I love traveling around the province and exploring, but I don't think I would have loved living in a tent all the time, moving around as needed to find food, dependent on nothing but a tent and a fire to stay warm through the coldest months. I am grateful for my nice sturdy house when the wind is howling and the snow is falling! 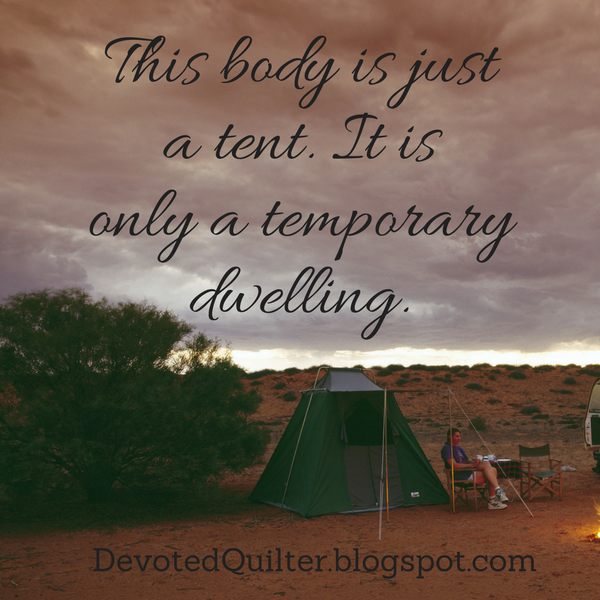 The Bible sometimes refers to our physical bodies as tents. In 2 Corinthians 5:1 Paul wrote, "For we know that if the earthly tent we live in is destroyed, we have a building from God, an eternal house in heaven, not built by human hands." And Peter wrote, "I think it is right to refresh your memory as long as I live in the tent of this body, because I know that I will soon put it aside, as our Lord Jesus Christ has made clear to me" (2 Peter 1:13, 14). What I find interesting about this analogy is that tents are not very sturdy; they're easily torn or destroyed. Those in the past who lived in tents full time would have had to be constantly repairing or replacing them. The older the tent, the more patches it would have had and the more work it would have taken to keep it functional. Isn't that just like our bodies? We get scraped and bruised, bones get broken, we get sick. Definitely, the older the body the harder it is to keep it functional! The wonderful thing is, these tents we're living in now aren't what we'll be living in forever. Paul said that after this earthly tent is destroyed, we will have an eternal house, built by God. What a promise! When our bodies give out and we die, whether through sickness, old age or some tragic accident, our easily damaged earthly bodies will be replaced by something far, far better. I also find it interesting that Peter referred to his coming death as a 'putting aside' of 'the tent of this body.' While I don't think any of us welcome death, there's comfort in knowing that our physical death is not the end. Nor has it been the end for any of our loved ones who have already died. They've merely put aside the tent of their earthly bodies and are now in the eternal body made by God for them. Isn't it amazing to think of seeing them again, someday, after we have put aside our own earthly tents? One more interesting thought is that tents are temporary. Even those who lived in tents all the time viewed them as temporary, though for them this was because they often moved around with the seasons, following their food sources. They would take their tents down, carry them to the next place and set them up again. For us, the tent of this body is temporary because when this life is over and we are in heaven with God, we will live forever in those eternal bodies He has made for us. We can't really imagine what those eternal bodies will be like, but they can be sure they will be as different from our earthly bodies as my camping tent is from my house. 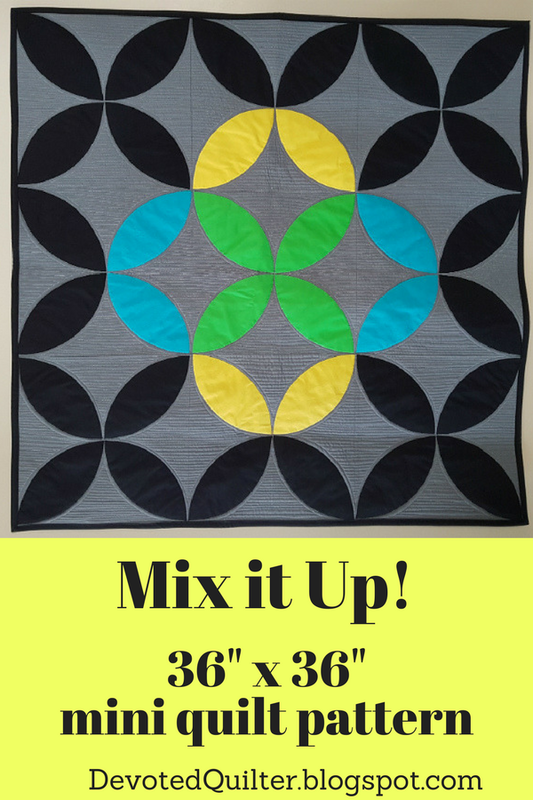 My Mix it Up! 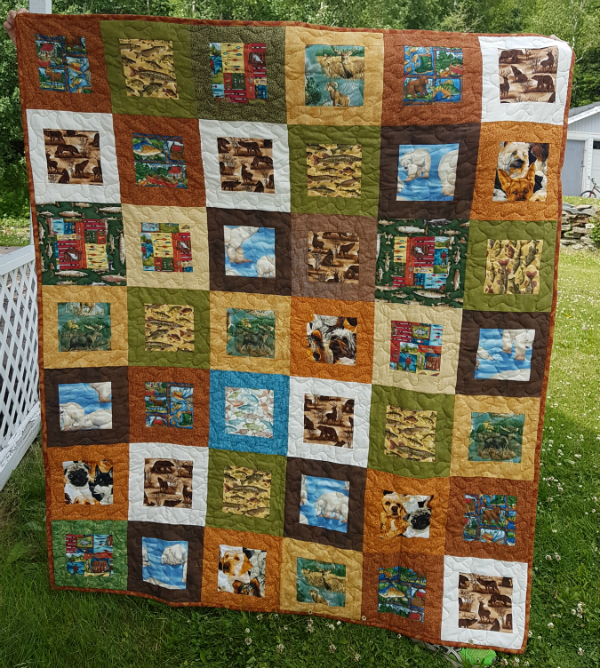 mini quilt pattern is now available in both my Etsy and Payhip shops! 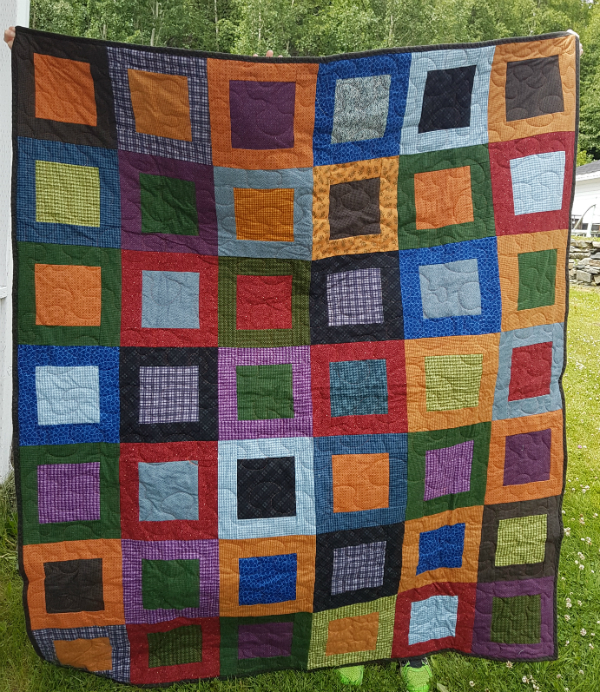 Have fun playing with colour in this 36" x 36" mini quilt. 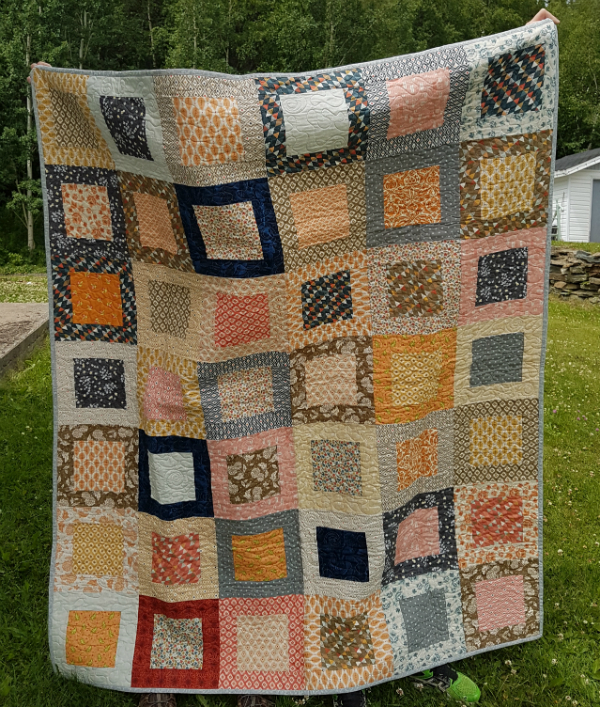 Made with machine applique and simple blocks, this quilt comes together quickly and allows you to experiment with your favourite colours. Solids or prints, or even some of both, mix it up however you like. Use blue and yellow to make green, as shown, or try red and white to make pink, red and blue to make purple or change the background colour and use black and white to make grey. What colours will you mix up? Get your pattern now at Etsy or Payhip. Kitty of The Night Quilter, has done all the photography for the Planner again this year and her photography is just so beautiful. I love this close up shot. Churn came about when I challenged myself to use a traditional block in a non-traditional setting. 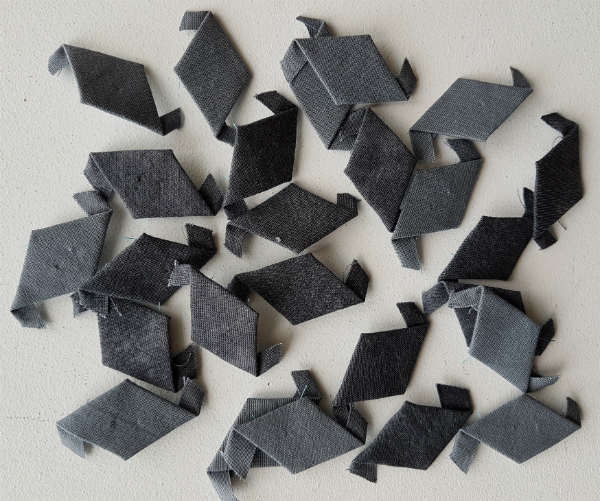 Once I had the small churn dash blocks in the design, I added the bold grey to kind of echo the shape of the churn dash and I loved the simplicity of it. I didn't want all that negative space to be boring, though, so I used low-volume patchwork to fill it up. The result is a design that comes together quickly, but has plenty of interest. 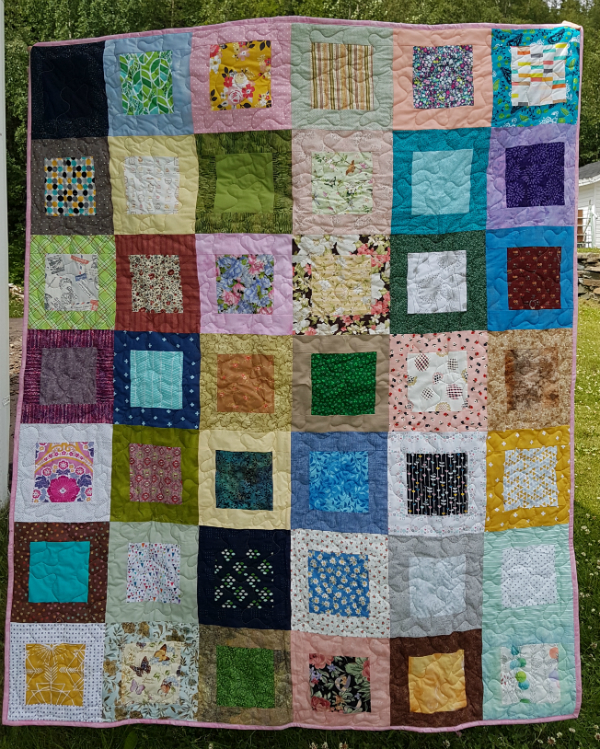 I left the teal churn dashes unquilted other than stitch-in-the-ditch and a spiral in their middles. 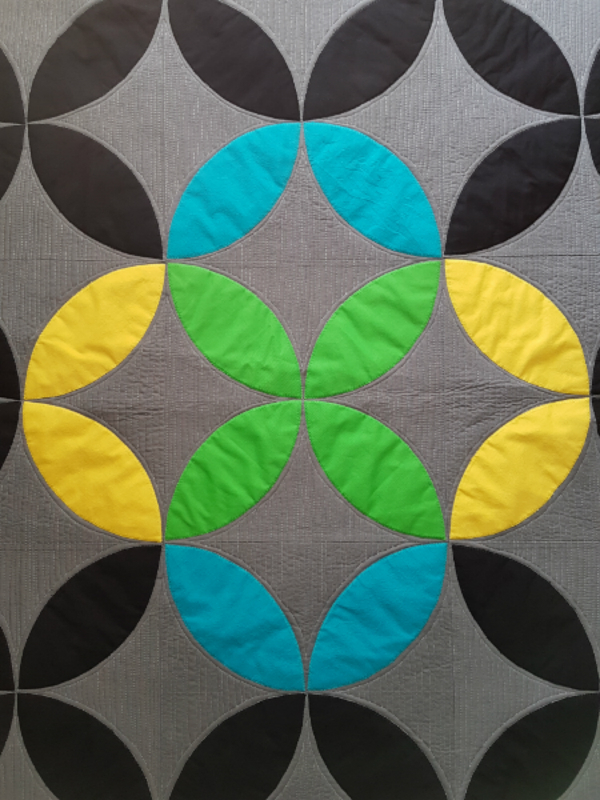 The grey is quilted with dense matchstick quilting in Aurifil 1158 and the background is quilted in an echoed loop design in Aurifil 2600 (which really does work with any colour!). 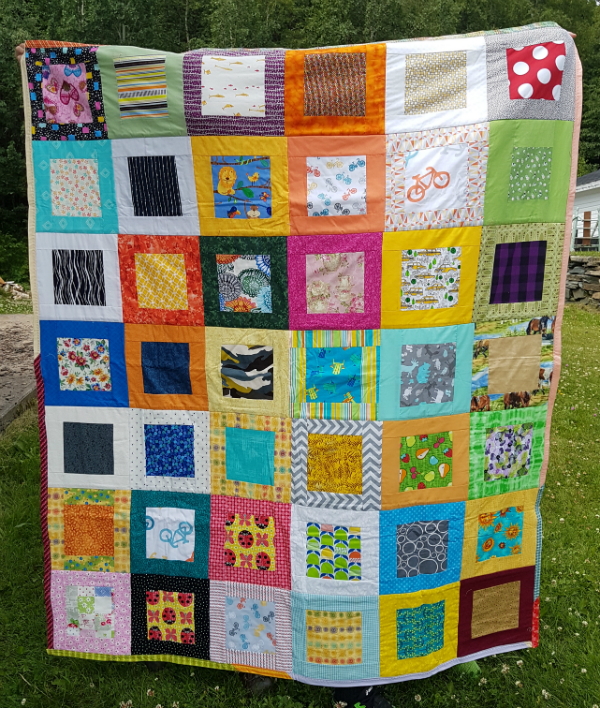 All 13 of the projects in the 2018 Quilter's Planner (affiliate link) will be in a full colour companion magazine this year. 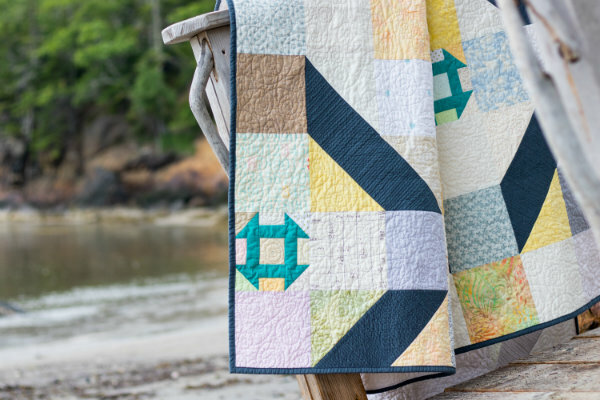 There's also a gorgeous sampler quilt pattern, designed by Cheryl of Meadow Mist Designs. Pre-orders for the Planner are available now, so be sure to get your copy (affiliate link). International orders can be placed through the Fat Quarter Shop. *This post contains affiliate links, which means if you click the link and then make a purchase I may receive a small commission. This does not affect the price you pay. I just finished reading Gretchen Rubin's Better than Before, which has the subtitle Mastering the Habits of our Everyday Lives. I found the analysis of habit formation strategies really interesting, and I was especially interested in how some habits (like brushing our teeth) become second nature and we never really have to decide to do it again. We just brush our teeth without thinking about it. Other habits, though, we have to constantly stay on top of or we will talk ourselves out of them (like exercising). Even the things we really want to do can sometimes be subject to our lazy nature. We can always find excuses for not doing the things we want to do, whether that's a hobby or eating healthy or working out, and usually those excuses center around something like, "I've been doing so well, I deserve a break." Or maybe it's "Just this once, then I'll get right back to it." Can you relate? I know I'm guilty of telling myself both of those, and then the habit I'm trying to maintain slips and becomes harder to get back to. In Galatians, Paul wrote, "Let us not become weary in doing good, for at the proper time we will reap a harvest if we do not give up" (Galatians 6:9). And in Ephesians, he wrote, "For we are God’s handiwork, created in Christ Jesus to do good works, which God prepared in advance for us to do" (Ephesians 2:10). If you put the two verses together, it sounds to me like we should always be doing good works of some sort, and that there's the chance we will get tired of doing them because we aren't always going to see the results right away. That's kind of like keeping a habit, isn't it? Eating healthy is something we know we should do, and maybe we even want to do it, but it's not always easy. Sometimes we just don't see the results of the good we're doing and that makes it hard to stick with it when we're tempted by treats. Likewise, being kind to that person who is always negative or rude isn't always easy, and it can be hard to stick with it when nothing ever seems to change. But God promises us that we will reap a harvest if we don't give up. We may not know what exactly that harvest will be, or when it will come, but we can be sure it will happen if we stick with the habit of doing good. And we can be sure it won't happen if we get weary and give up. For each of us, the habit of doing good will look slightly different because our lives and circumstances are different. Some of us are in the habit of helping people who are sick or shut in. Others are in the habit of praying for their community or their pastors or coworkers. Others are good at listening to everyone. Others are encouragers and still others seem to have an endless supply of patience and kindness for even the most difficult people. While our habits of doing good will be different, we all have the same promise from God. Someday, in some way, a harvest will come from our faithfulness to keeping that habit of doing good. That means we need to be constantly on guard against the temptation to blow off the habit for a day, or a week, or even forever. 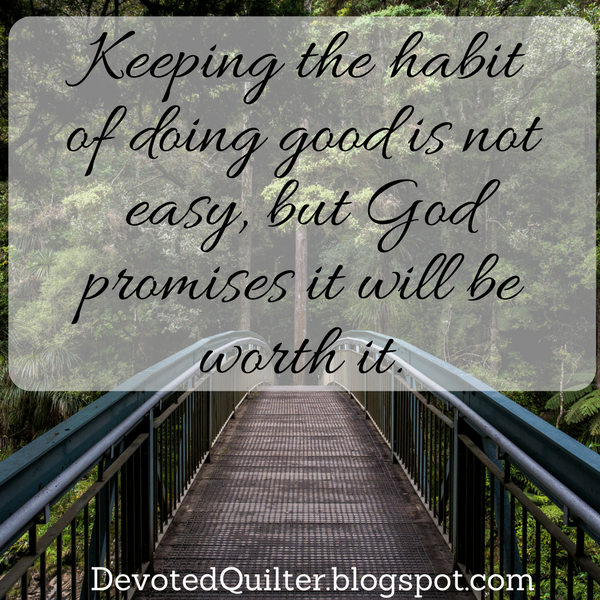 Sticking with the habit of doing good won't always be easy, but God promises it will be worth it. Every spring I find myself yearning for summer vacation and thinking of all the sewing I'll be able to get done. 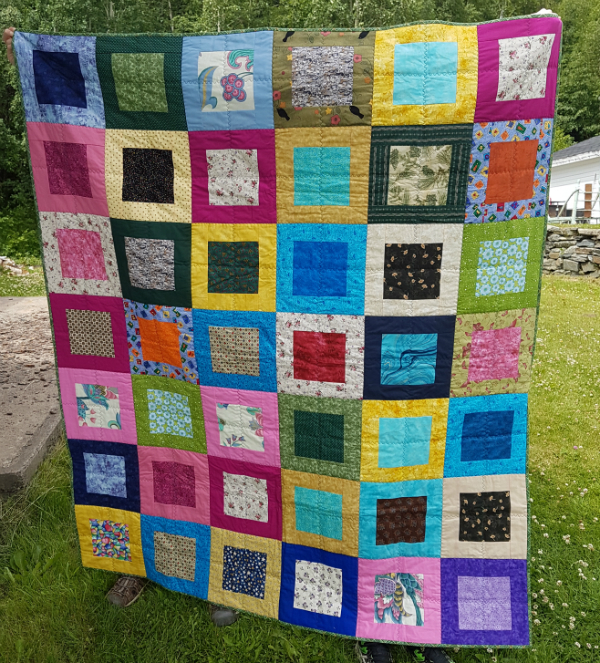 Just think about it - no babysitting (because school's out and I only babysit teacher's kids) and my boys are old enough now that they don't need so much of my attention, so I can sew for hours every day if I want to! Projects are lined up 6 deep in my head. 1. There are other things going on. Whether it's hiking, picking strawberries, swimming at the pool, reading in the backyard or whale watching...there are lots of things going on in the summer that don't happen much during the school year. Plus, when it's nice outside, I feel like I should spend as much time as possible out there enjoying it. After all, we spend most of the winter months inside. 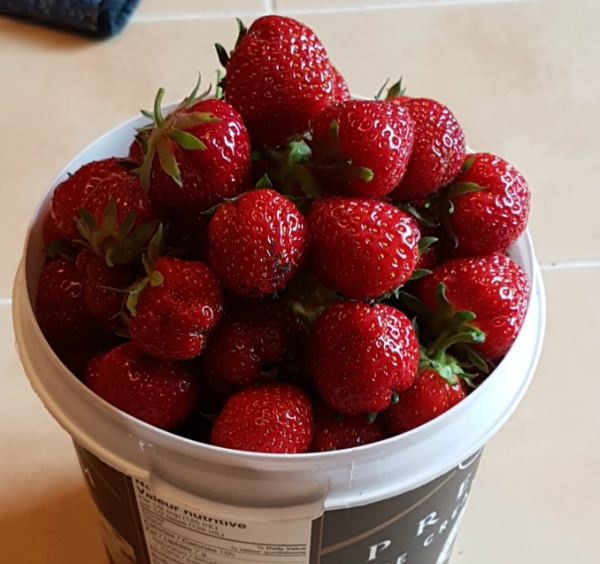 It doesn't get much more fresh than picked from the backyard! Seen on a hike with Paul, the boys and my parents this week. 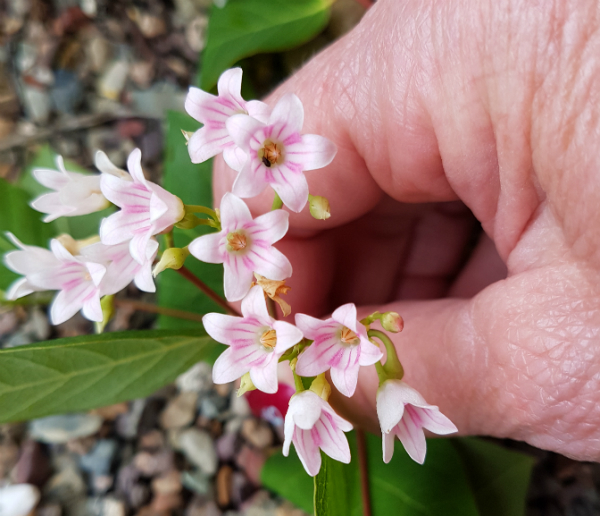 Spreading dogbane, which looks like it deserves a much prettier name. Seen on the same hike. 3. Summer = Lazy. This is the biggest factor, I think. I'm sleeping in, then lingering over a cup of tea. I'm reading more (I finished Gretchen Rubin's Better than Before last night) and going for more walks. I said to my husband one day last week, "I love the lazy summer days, but I sure don't feel very productive lately!" The summer hasn't been a total bust, of course. 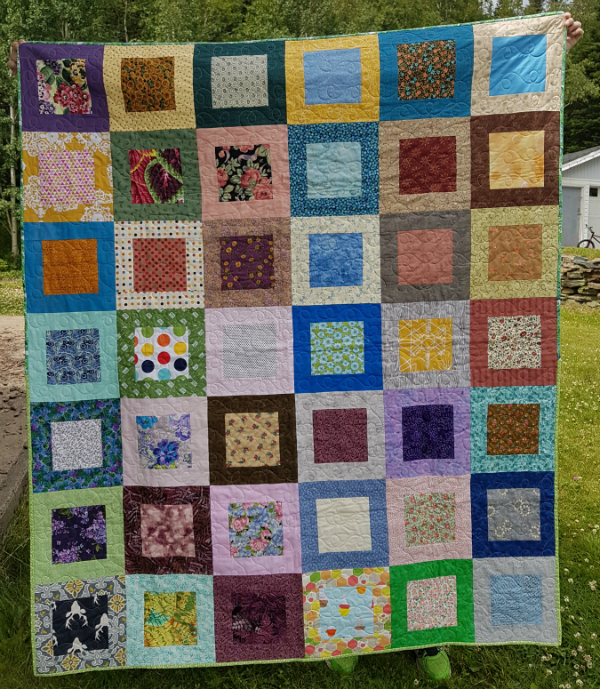 I've basted some diamonds for my Scattered Stars quilt and sewn a few pieces together while we've been driving here and there. 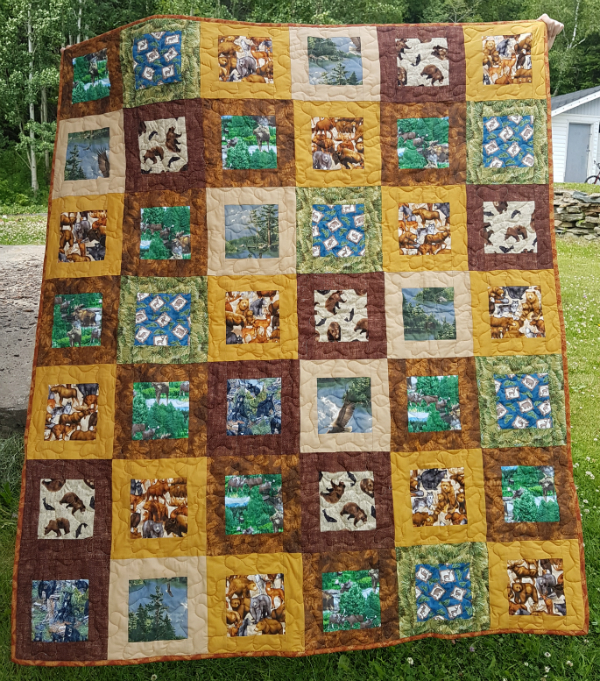 I've been working on getting the quilts for the seniors finished and packaged up and out the door (still working on that last part). I made some ornaments. Mostly, though, I'm hanging out in the sunshine and enjoying the relaxation. Yesterday, for the first time ever, I watched humpback whales breaching and slapping their fins on the water. It was amazing! Are you enjoying your summer (or winter for those Down Under)? Do you find your sewing (or not sewing) goes through seasonal changes? 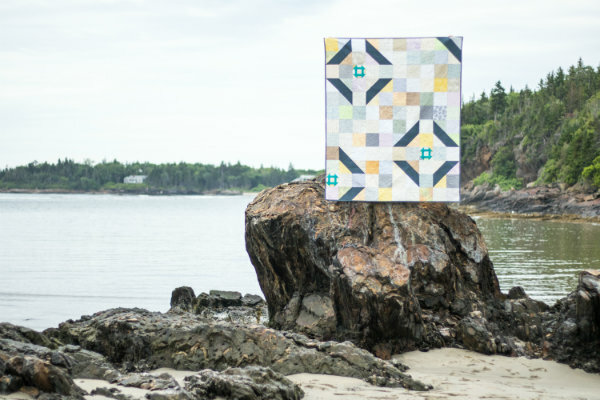 It's time to pre-order your copy of the 2018 Quilter's Planner! 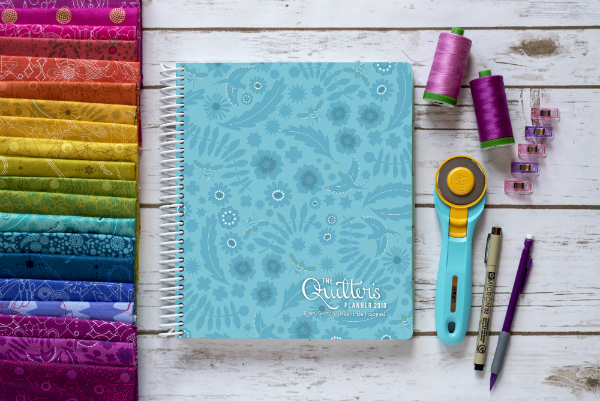 Designed by Stephanie of Late Night Quilter, the Quilter's Planner is a great tool for planning your everyday stuff and your quilting stuff, all in one place. I've had both the 2016 and 2017 versions and I can't wait to get my hands on this newest edition. This year's featured designer is Alison Glass and the Planner includes stickers and colouring pages designed by Alison. * This post contains affiliate links, which means if you click the link and make a purchase, I may receive a small commission. This does not affect the price you pay. 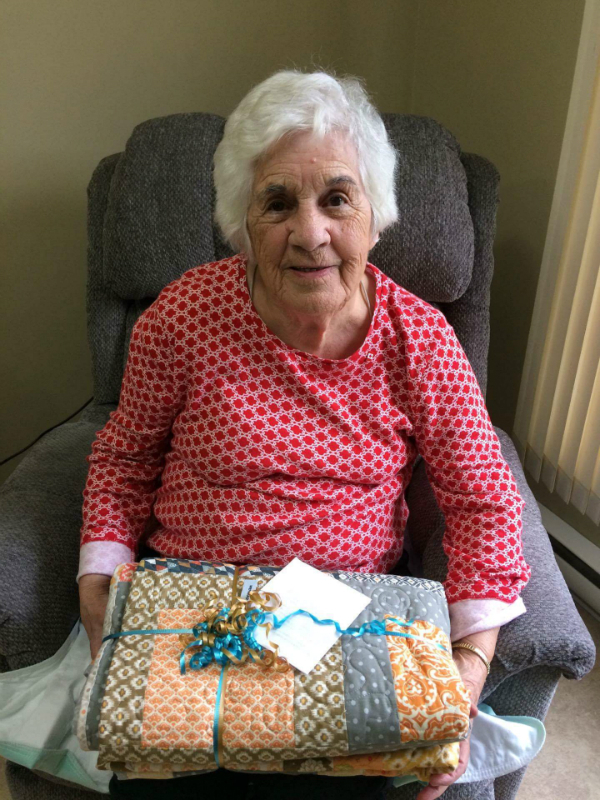 Quilts for Seniors - 21 Finished Quilts! 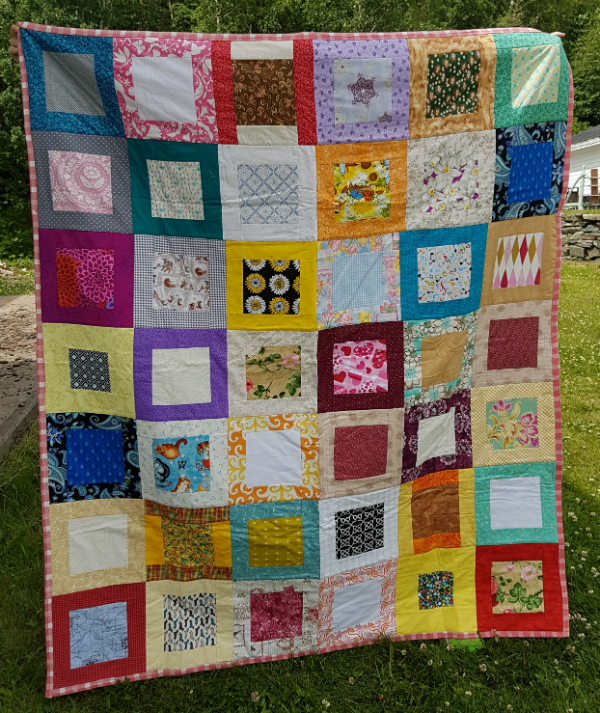 All of the quilts for the residents are finished!!! 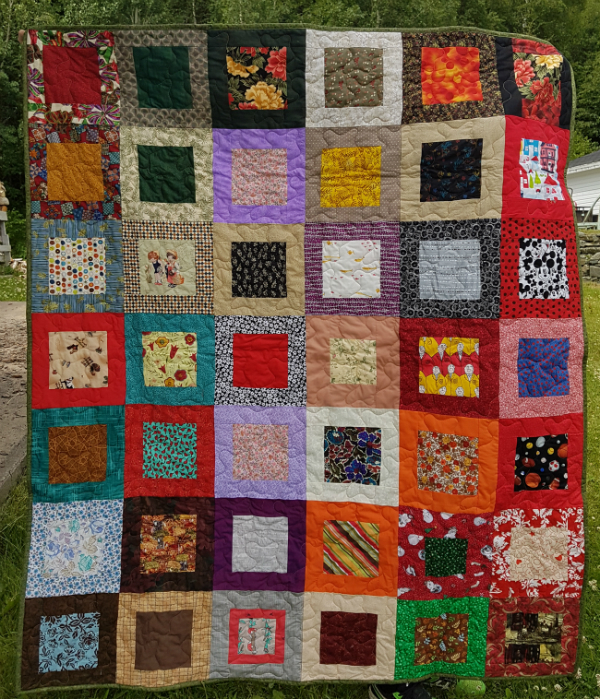 That's 21 quilts made for the seniors who lost everything in a fire back in April, ready for delivery, thanks to all of you who donated blocks, batting, backing, binding, money and time! Thank you so much! 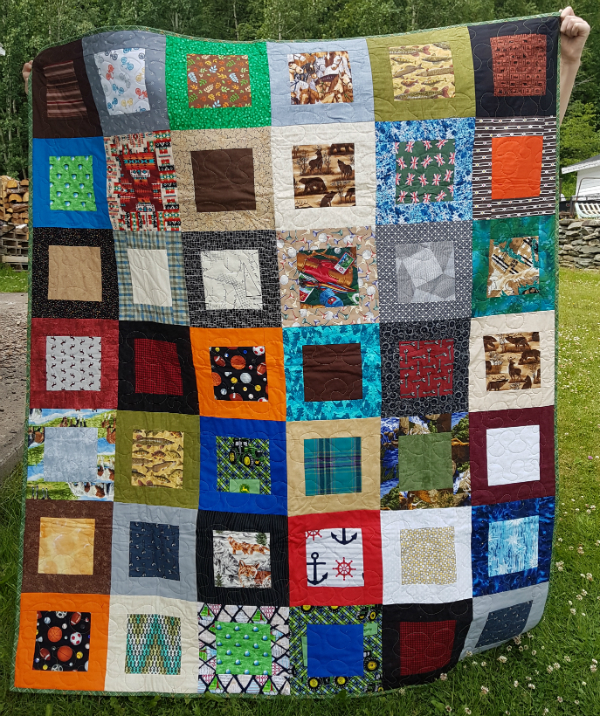 If you donated a quilt or some blocks and don't see them in these pictures, don't worry. I do have them and they are going to be used. 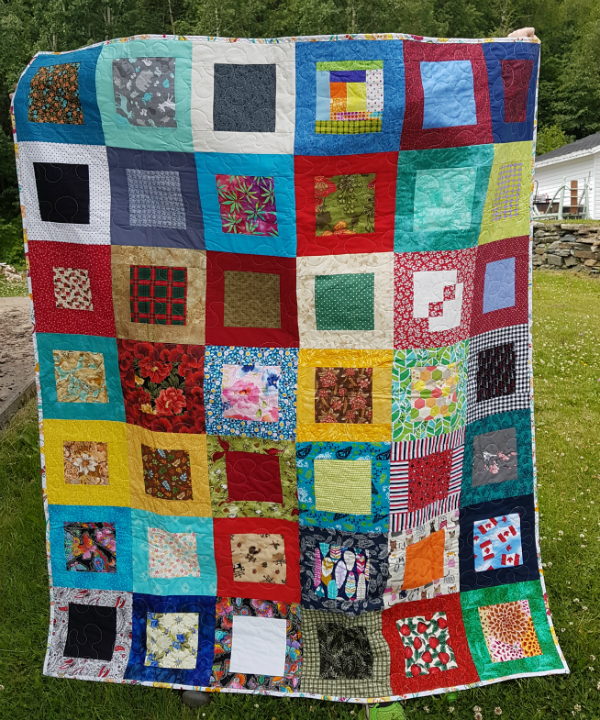 I have enough quilts left over after the 21 I set out to make that I'll also be giving quilts to all of the employees of the home, plus all of our town's first responders. 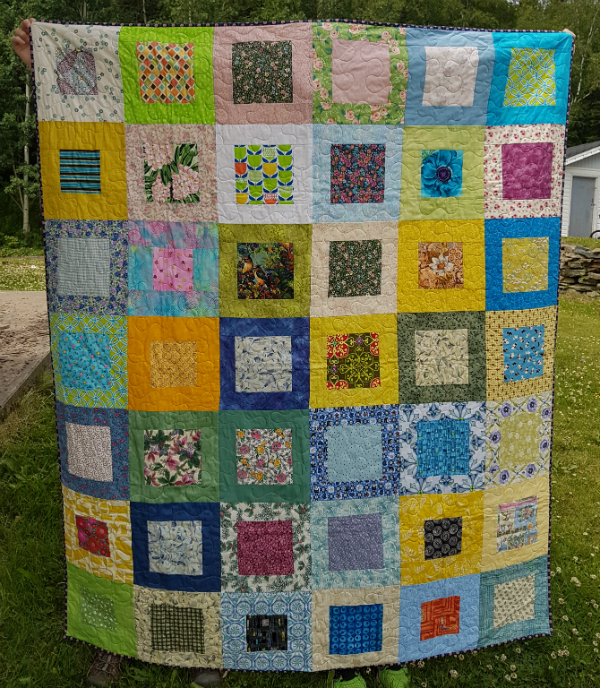 Those are still in progress, so this isn't the last you'll see of these charity quilts. 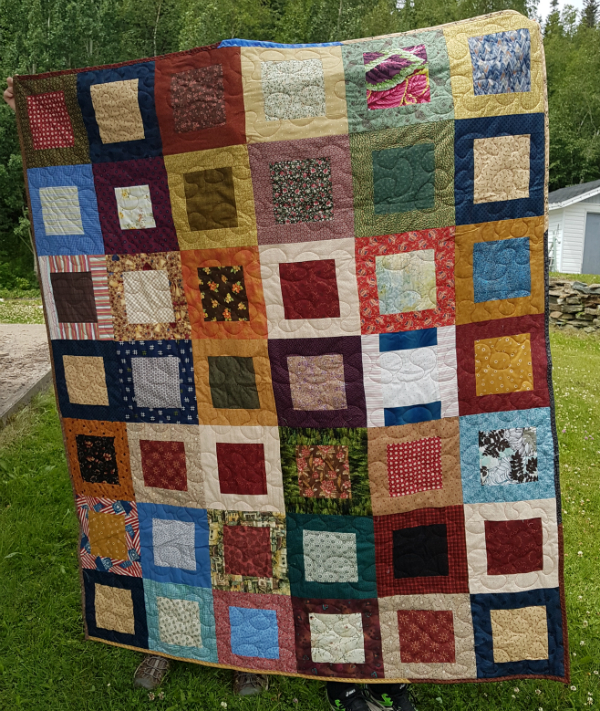 This next quilt was made by a woman who lost her father in a house fire a couple of years ago. 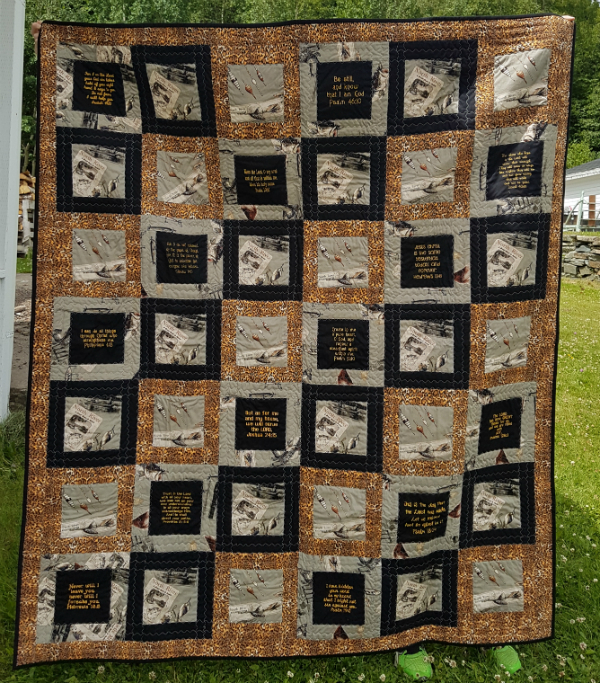 It's hard to pick out in the picture, but the machine embroidered blocks all have bible verses on them. 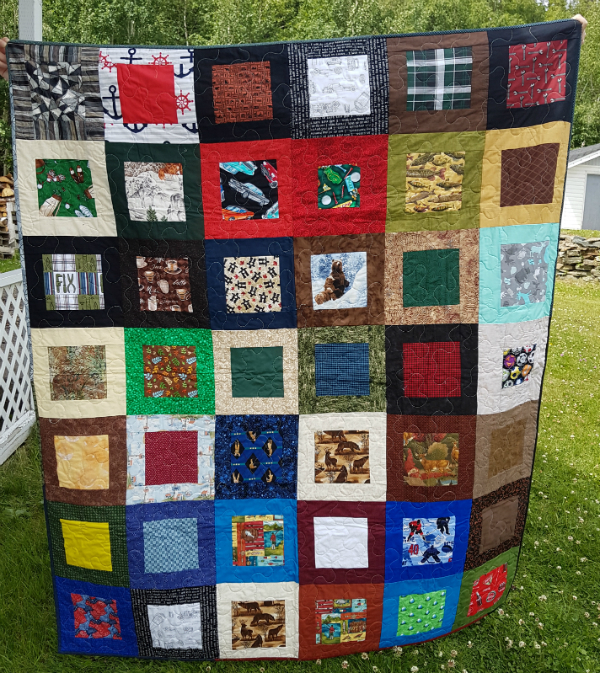 I checked with the manager of the home to see if any of the men would especially appreciate this quilt and she told me there is one man of great faith, so this quilt will go to him. It's a pretty wild assortment of blocks, isn't it?? 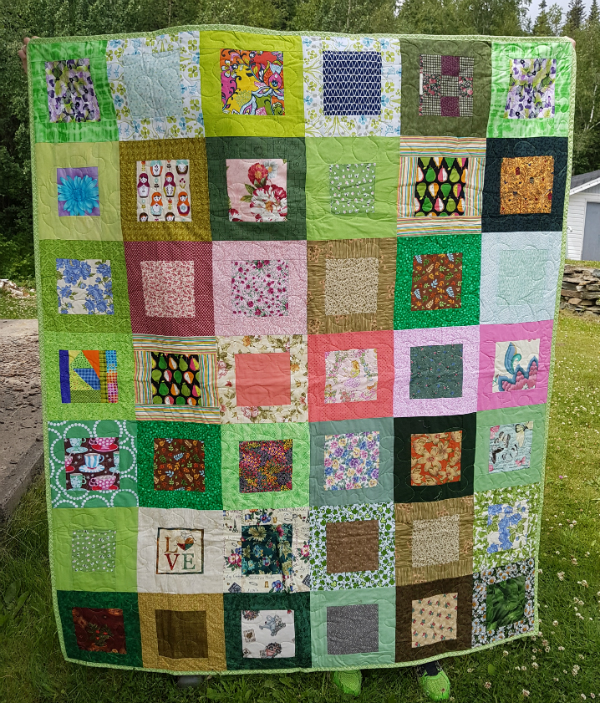 It's amazing how beautiful the quilts are considering how much variety there is in colour and style, but somehow it all works. 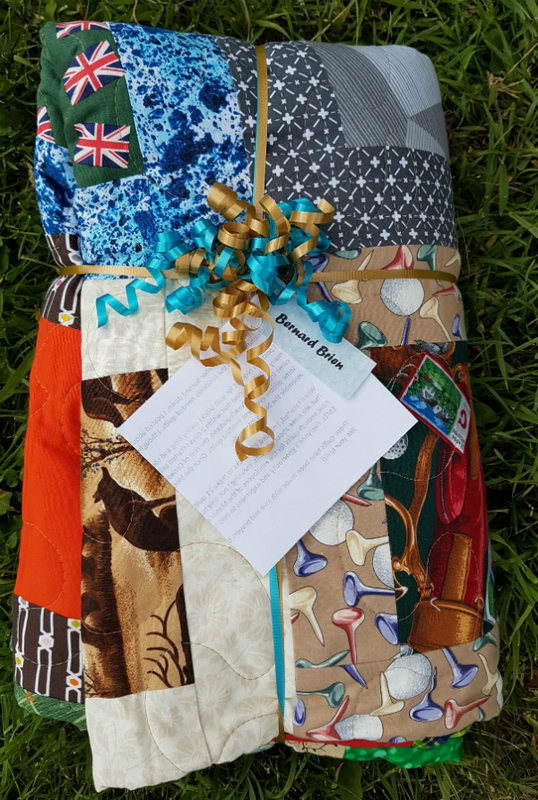 These 21 quilts are all packaged up and ready to go, including a short letter explaining where the blocks came from. 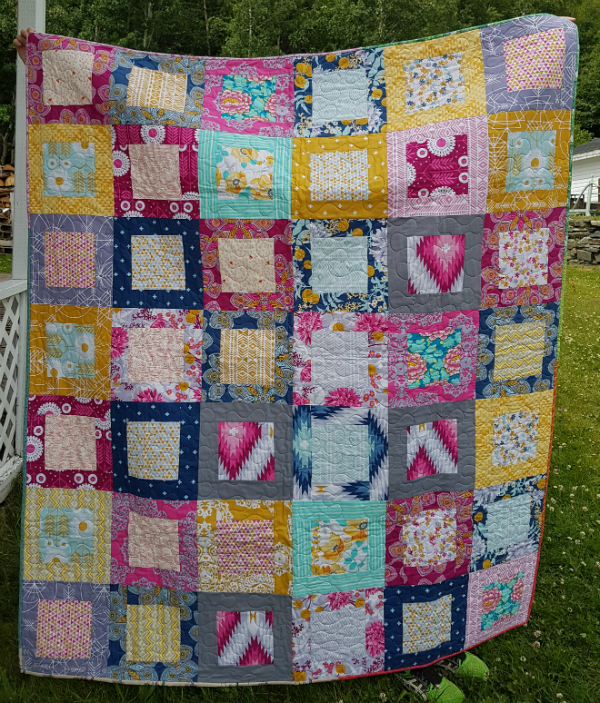 In fact, the quilt in this picture is already gone. 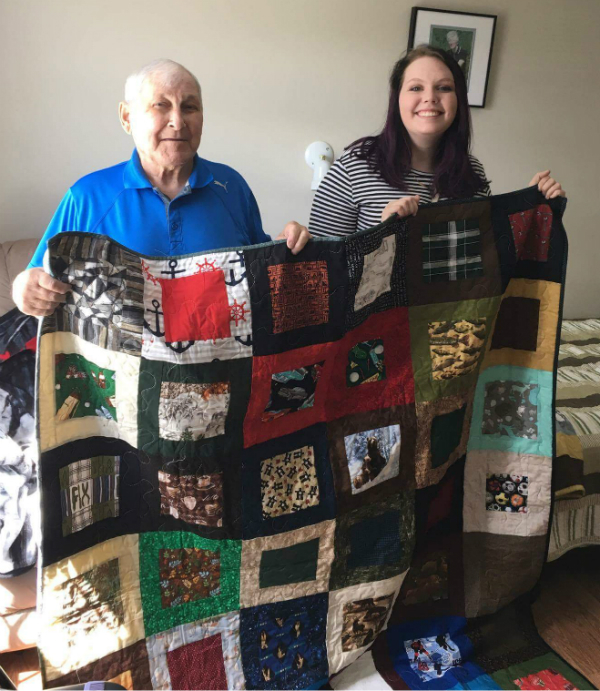 Mr. Brien moved to Alberta after the fire to live with family, but his son-in-law was here in town last week, so he picked up this quilt to take home to Mr. Brien. 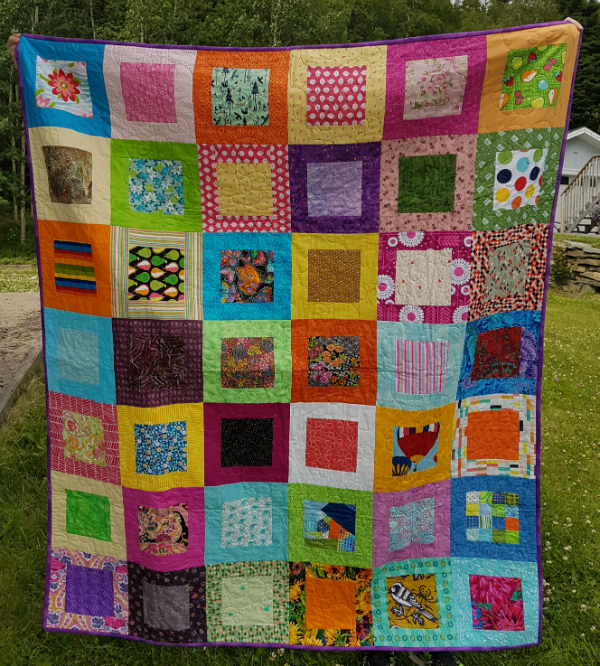 I'm hoping to get some pictures of the residents with their quilts when they are delivered. If I do, I'll be sure to share them here. 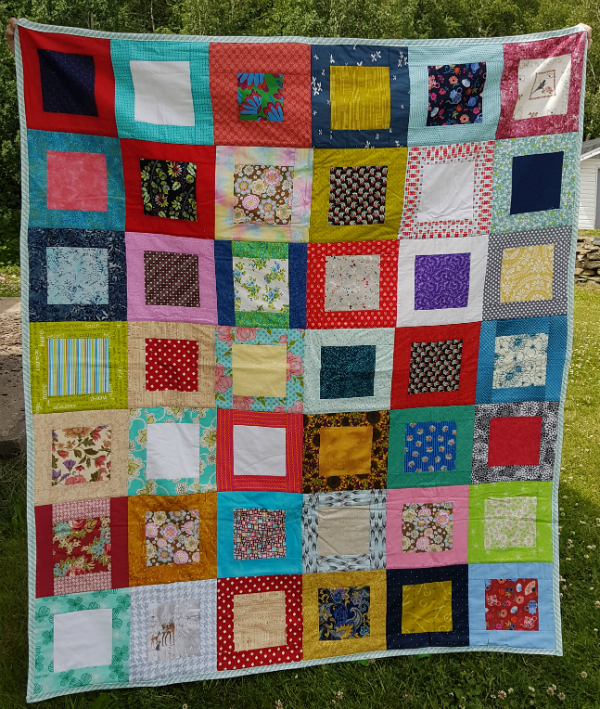 I am so excited to have these quilts going to their new homes, and I pray they will be a blessing to the residents. Again, thank you so, so much for helping make this whole project happen! I'm sure you were looking carefully, and I'm curious...Did you see your blocks?